Bonnie Soon stopped by the ArtStarts Gallery on Saturday to lead two lively Taiko drumming workshops. Using garbage can as drums, kids and parents learned the basic stance and movements involved in Taiko drumming, and also did some fun vocal shouts! Participants began by drumming to the beat of their names and quickly thereafter moved on to learning traditional, Japanese rhythms. 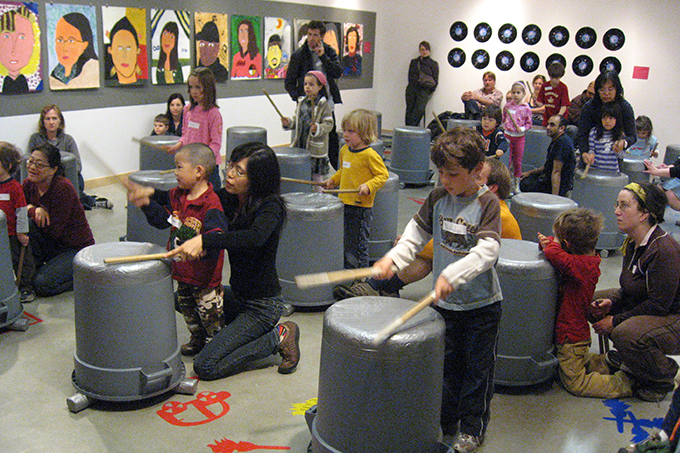 Kids learned that "taiko" means "big" in Japanese and "bachi" is the Japanese word for the drum sticks. Thanks to Bonnie for an invigorating workshop! Make sure to check out Artstarts on Saturdays in June for a storytelling workshop with Kathryn Ricketts!